Middle East Perspectives by Rick Francona: European Union demands that Iran agree to talk??? You can't make this stuff up. 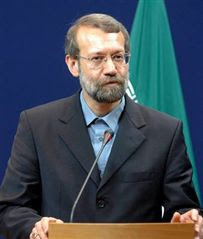 Note Speaker of the Iranian parliament Ali Larijani's attempt to stifle a laugh. According to a draft statement being circulated among the member countries, the European Union proposes to establish a deadline for Iran to agree to more talks about its nuclear program. Are they serious? Of course Iran will agree to talk - that is all they have ever truly agreed to do. The farce of an agreement in October by which Iran would export its stockpile of low-enriched uranium was merely the latest in a series of Iranian delaying tactics. As I have said repeatedly, they agree to talk - all the while enriching several kilograms of uranium each day. Here is the EU's stern, punishing threat to Iran: agree to come back to the negotiating table by the EU meeting at the end of January, or we will "consider" supporting a sanctions protocol wanted by the United States. Yes, that's right - they might consider doing something if the Iranians don't agree to talk. Finally, the Europeans have delivered a devastating ultimatum to the Iranians. I imagine this has sent shock waves throughout the Iranian leadership. No doubt they are having special meetings in Tehran to deal with this crisis. I am going to go out on a limb here and predict that the Iranians will agree to have talks. Yes, they will agree to once again talk about having more talks about their nuclear program. They have always declared that their nuclear enrichment program itself was non-negotiable, but that they would agree to talk about having talks. It seems we are about to repeat this "self-licking ice cream cone" kabuki dance. Satire aside, this is a welcome, albeit virtually meaningless gesture. The key players in the Iranian sanctions debate are the five permanent members of the United Nations Security Council - the United States, the United Kingdom, France, Russia and China. Although in recent weeks Russia has softened (but not abandones) its opposition to tough sanctions on Iran, China remains steadfast that diplomacy needs to be given more time. I don't know how much more time the Chinese have in mind, but at some point it will be too late and Iran will present the world with a fait accompli and declare that it is a nuclear-armed state. It is important to also note the somewhat surprising position of Turkey on sanctions. They have also stated that diplomacy needs more time. In the past, Turkey was concerned about Iran's quest for a nuclear weapon and its support of terrorist groups - Turkey has been a frequent victim of Islamist terrorist attacks. That appears to have changed. Perhaps the Turks have concluded that the new American administration is not going to be able to stop Iran from acquiring a nuclear weapon and is attempting to incur favor with the mullahs in Tehran. If there is a sanctions regime put in place, Turkey, with its border with Iran, will be a key player in the enforcement protocol. Again, Iran seems to have convinced the world that be agreeing to endless talks that there may be a successful diplomatic outcome to the nuclear issue. I doubt there will be - I also doubt there will be effective sanctions. This issue is not going away soon.